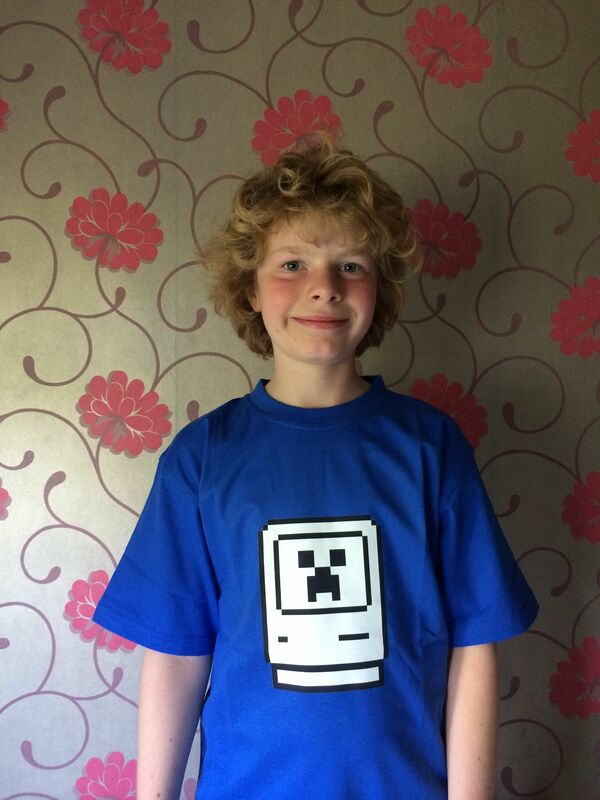 Here is our Macminecraft T-Shirt Design we got via 99Designs. It’s a classic mash up of the Apple Happy Mac and a Minecraft Creeper! A Happy Mac is the normal bootup (startup) icon of an Apple Macintosh computer running older versions of the Mac OS operating system. It was designed by Susan Kare in November 1983, and resembles models of the Compact Macintosh series. The icon remained unchanged until the introduction of the PowerPC Macs, when it was updated to 8-bit color. Adoption of this new icon was not universal for all Macs, however, as some late PowerPC Macs still had black and white “Happy Mac”. The Happy Mac indicates that booting has successfully begun, whereas a Sad Mac (along with the “Chimes of Death” melody or one or more beeps) indicates a hardware problem. Creepers are common hostile mobs that use a suicide-style attack: They approach players and then explode, causing massive damage to players, entities, and blocks within a short radius. Creepers spawn in the overworld at night, and in locations with a light level of 7 or less, just like most other hostile mobs. However, unlike Zombies and Skeletons, Creepers will not catch fire in sunlight, and those spawned in darkness will continue to roam in daylight until they perform an attack, are killed, or despawn. Creepers are especially dangerous due to their near-silent approach, save for light footsteps and an occasional rustling noise. A Creeper will warn the player moments before it explodes with an infamous burning fuse noise. If the player can manage to move far enough within about one second of this noise, the explosion will be canceled, and the creeper will attempt to approach again. Creepers run from cats and ocelots, and will ignore the player to run away when a feline is too close. As cats can be acquired and controlled by the player, this provides an important avenue of defense from Creeper attacks. Creepers have become notorious and infamous among Minecraft players for their infuriating habit of sneaking up on the Player to inflict devastating damage following an all-too-short warning sound. They have arguably become the most recognizable image from Minecraft, as well as the game’s unofficial mascot. We tested out 99Designs to develop our design, overall the results we pretty good you can see them here. 99designs pioneered the design contest, where designers submit competing designs in response to a customer’s design brief—and the winner receives a cash payment for their work. Through more than 321,839 design contests, we’ve paid out US$80,456,894 to our designer community to date. We also sell ready-to-use logos through our Readymade logo store, and help customers and designers manage ongoing design work through our 1-to-1 Projects platform. With offices in Melbourne, San Francisco, Berlin and Paris, 99designs now has a staff of more than 75 passionate people working around the clock to help customers find the perfect design—and their dream designer. Back in 2008, 99designs’ Founder Mark Harbottle locked colleagues Lachlan Donald and Paul Annesley in an office in Melbourne to pioneer a new kind of marketplace for graphic design. By 2010, the business had opened offices in San Francisco and won the prestigious Webby People’s Voice Award for Best Web Service and Application.